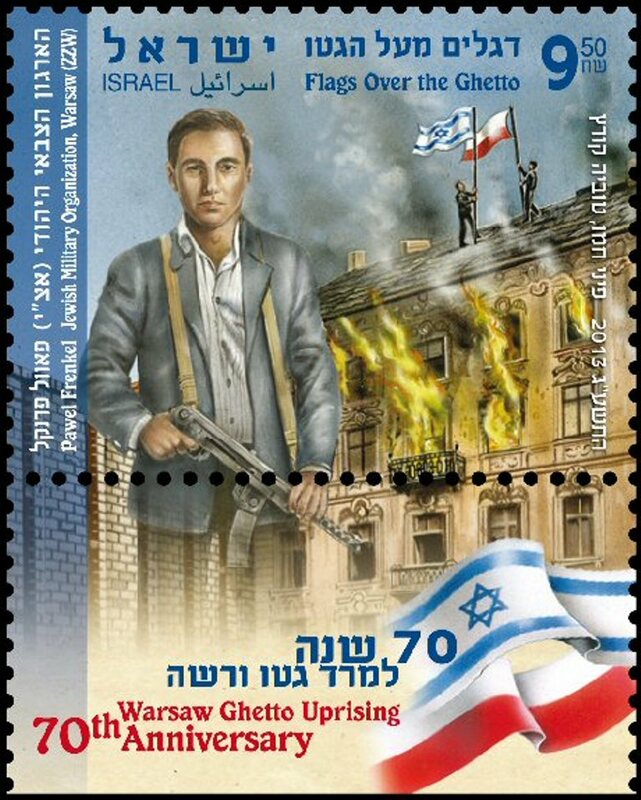 Żydowski Związek Wojskowy (ŻZW, Polish for Jewish Military Union) was an underground resistance organization operating during World War II in the area of the Warsaw Ghetto, which fought during the Warsaw Ghetto Uprising and 1944 Warsaw Uprising. It was formed primarily of former officers of the Polish Army in late 1939, soon after the start of the German occupation of Poland. 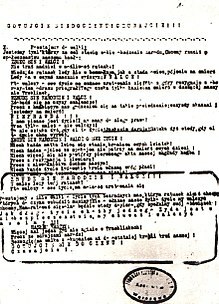 Due to the ŻZW's close ties with the Armia Krajowa (AK), which was closely linked to the Polish Government in Exile, after the war the Soviet-dependent People's Republic of Poland suppressed publication of books and articles on ŻZW. Its role in the uprising in the ghetto was downplayed, in favour of the more socialist Żydowska Organizacja Bojowa (Jewish Fighting Organization). The ŻZW was formed some time in November 1939, immediately after the German and Soviet conquest of Poland. Among its founding members may have been Dawid Mordechaj Apfelbaum (there is some debate as to whether Apfelbaum is a real or fictional person), a pre-war Lieutenant of the Polish Army, who proposed to his former superior, Captain Henryk Iwański, the formation of a Jewish en cadre resistance as an integral part of the general Polish resistance being formed at that time. At the end of December such an organization was indeed formed and received the name of Żydowski Związek Walki. On January 30, 1940, its existence was approved by General Władysław Sikorski, the Polish commander in chief and the prime minister of the Polish Government in Exile. Initially consisting of only 39 men, each armed only with a Polish Vis 9 mm semi-automatic pistol, with time it had grown to become one of the most numerous and most notable Jewish resistance organizations in Poland. Between 1940 and 1942 additional cells were formed in most major towns of Poland, including the most notable groups in Lublin, Lwów and Stanisławów. 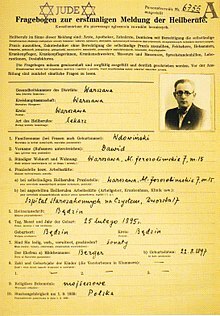 Although initially formed entirely by professional soldiers, with time it also included members of pre-war right wing Jewish-Polish parties such as Betar (among them Perec Laskier, Lowa Swerin, Paweł Frenkel, Merediks, Langleben and Rosenfeld), Hatzohar (Joel Białobrow, Dawid Wdowiński) (Political Chair), and the Revisionist faction of the Polish Zionist Party (Leib "Leon" Rodal and Meir Klingbeil). Although the ŻZW was active in a number of towns in Poland, its major headquarters remained in Warsaw. When most of the Jewish inhabitants were forced into the Warsaw Ghetto, the ŻZW remained in contact with the outside world through Iwański and a number of other officers on the Aryan side. By the summer of 1942, the League had 320 well-armed members in Warsaw alone. During the first large deportation from the Warsaw Ghetto, the ŻZW received the news of the German plans and managed to hide most of its members in bunkers, which resulted in fewer than 20 of them being arrested by the Germans. Although Dawid Mordechaj Apfelbaum could not convince Adam Czerniaków to start an armed uprising against the Germans during the deportation, the organization managed to preserve most of its members - and assets. It also started to train more members and by January 1943 it already had roughly 500 men at arms in Warsaw alone. In addition, the technological department of the ŻZW, together with Captain Cezary Ketling's group of the PLAN resistance organization managed to dig two secret tunnels under the walls of the ghetto, providing contact with the outside and allowing smuggling of arms into the ghetto. The military leader of the ŻZW at the time of the uprising was Dr. Paweł Frenkiel, and its political leader (Zionist Revisionist), Dr. David Wdowiński. The organization was divided onto groups of five soldiers. Three groups formed a unit, four units formed a platoon and four platoons - a company, composed of roughly 240 men. In early January 1943 the ŻZW had two entirely manned and fully armed companies and two additional en cadre companies, to be manned by newly arrived volunteers when need arises. This indeed happened in April 1943, though the actual number of ŻZW soldiers to take part in the Uprising is a matter of debate. Apart from the fighting groups, the ŻZW was organized into several departments. Already during the war the influence and the importance of the Żydowski Związek Wojskowy was being downgraded. The surviving commanders of the leftist ŻOB either did not mention the ŻZW's fight in the Warsaw Ghetto Uprising in their writings at all, or belittled its importance. Also the war-time Soviet propaganda did only briefly mention the fighters as they collided with its aims of presenting the Soviet Union as the only defender of the European Jewry. In addition, except for Dawid Wdowiński none of the high-ranking commanders of the ŻZW survived the war to tell their part of the story and it was not until 1963 that Wdowiński's memoirs were published. This led to a number of myths concerning both the ŻZW and the Uprising being commonly repeated in many modern publications. This was even strengthened by the post-war propaganda of the Polish communists, who openly underlined the value of the leftist Żydowska Organizacja Bojowa, while suppressing all publications on the Armia Krajowa-backed ŻZW. The "Contact" ring used as a sign between the ŻZW and the Armia Krajowa is displayed in Yad Vashem. A means of identification, used in particular during meetings of higher level officers, were two identical gold rings set with a red stone engraved with Jewish symbols. It was not enough for the contacts to show the ring, they were expected to explain the significance of the symbols. The ring that was in the possession of the Jewish underground fighters, was destroyed in the ruins of the Ghetto. Its twin remained in the hands of Henryk Iwanski, the Polish underground fighter and later was brought to the museum in Jerusalem, Israel. In recent years, new research has been published on the ŻZW which has called into question the validity of some accounts, especially by Henryk Iwanski, which had influenced Maciej Kledzik, Marian Apfelbaum, Stefan Bratkowski and Moshe Arens and uncritically transmitted by many of those who wrote about the revolt and which later found their way into many secondary sources. The research of a Polish-Israeli team, for example, has raised many doubts around the veracity of testimony and memoirs by Henryk Iwański, Kalman Mendelson, Tadeusz Bednarczyk, Jack Eisner, David J. Landau, Maurice Shainberg, Joseph Greenblatt and a number of others. Moreover, they have suggested that Dawid Moryc Apfelbaum may actually have been an entirely fictitious figure and that the contact ring, the most emblematic relic of the Revisionist group, is in all likelihood a forgery. Dariusz Libionka and Laurence Weinbaum suggested the manipulations of the Communist secret police as the source of the alleged distortions. "[...] it should be emphasized that deconstructing the story of Apfelbaum and his purported Polish patrons in no way detracts from the heroism of the ZZW. Just the contrary. To be sure, the ZZW fought heroically and played a major role in the revolt. Unfortunately, after the uprising was put down, the ZZW was sentenced to drown in the waters of Lethe." ^ Moshe Arens (2005). "The Jewish Military Organization (ŻZW) in the Warsaw Ghetto". Holocaust and Genocide Studies. 19 (2). ^ a b c d e f Maciej Kledzik (October 2002). "ŻZW; Appelbaum w cieniu Anielewicza". Rzeczpospolita (in Polish). 10 (12). 2002-10-11. Retrieved 2006-05-09. ^ a b c d Moshe Arens (May 2003). "The Changing Face of Memory: Who Defended The Warsaw Ghetto?". Jerusalem Post. Archived from the original on 2006-05-26. Retrieved 2006-05-09. ^ a b c d e David Wdowiński (1963). And we are not saved. New York: Philosophical Library. p. 222. ISBN 0-8022-2486-5. Note: Chariton and Lazar were never co-authors of Wdowiński's memoir. Wdowiński is considered the "single author." ^ "Żydowski Związek Wojskowy". PWN encyclopedia (in Polish). Warsaw: Państwowe Wydawnictwa Naukowe. 2005. ^ Icchak Cukierman (1993). A surplus of memory: chronicle of the Warsaw Ghetto uprising. Berkeley: University of California Press. p. 702. ISBN 0-520-07841-1. ^ Pyotr Gorelik (August 2003). "КРЕПОСТЬ МАСАДА В ВАРШАВЕ (Masada fortress in Warsaw)". Zametki po Evreiskoy Istorii (in Russian). 2002-08-30 (32). Retrieved 2006-05-09. ^ Aleksandr Svishchev (July 2003). "Восстание в Варшавском гетто. Мифы и действительность (Warsaw Ghetto Uprising: myths and facts". Еврейские новости (Jewish News) (in Russian). 2003-07-23 (27 (51)). Retrieved 2006-05-09. Chaim Lazar (1966). Muranowska 7: the Warsaw Ghetto rising. Tel Aviv: Massada P.E.C. Press. p. 341. Maciej Kledzik (June 2004). "Zapomniani żołnierze (Forgotten Soldiers)". Rzeczpospolita (in Polish). 136 (2004-06–12). Retrieved 2006-05-09. Arens, Moshe, "Flags Over the Ghetto"
David Wdowiński (1963). And we are not saved. New York: Philosophical Library, 222. ISBN 0-8022-2486-5. This page was last edited on 15 February 2019, at 14:14 (UTC).